Dwight L. Moody had the words, "God is love," written above his pulpit. When he first began preaching, his zeal for God and his hatred for sin kept him from feeling the full force of these words. Then he preached that God was angry with the wicked and stood behind them with a drawn sword, ready to cut down sinners if they did not repent. In a measure, this is true. God loves the sinner, but He hates the sin. Unless we depart from sin, we shall perish with it; but God would have his love come first always. A young Englishman taught Moody to preach the love of God. When Moody first visited England, he met Harry Moorehouse. The people called him "the boy preacher." One day Moorehouse told Moody that he would like to go with him to Chicago and preach in his church. Moody said he looked at the beardless young fellow and decided he was too young to preach; so he did not let him know what boat he sailed on. But not long after, he received a letter stating that Moorehouse had arrived in the United States and that he would come out to Chicago and preach for him if he wished. Moody wrote him a very cold answer, telling him that if he came west, to call on him. In a few days he received another letter, telling him that Moorehouse would arrive in Chicago on Thursday. Moody did not know what to do. He had to be in another city over Friday and Saturday. But, finally, after thinking it over a long time and seeing no way out of the difficulty, he told his church officers that a young preacher from England was to arrive on Thursday and they had better invite him to speak the two evenings he was away. They too, were afraid that the young stranger might spoil the interest; but Moody said, "Well, try him." When he returned, about the first question he asked his wife was how the young preacher got on. 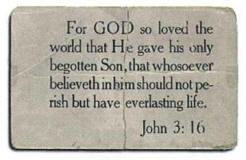 His wife said: "He has preached both nights from John 3:16. I think you will like him. He preaches a bit differently from the way you do." "How is that?" Moody asked. "He tells the people that God loves them," replied his wife. Moody said: "He is wrong; but I will ask him to speak again tonight so I can hear him myself." "I think you will agree with him after you hear him," Mrs. Moody said. Moody went down to the church, and he noticed everybody had Bibles. "My friends," began Moorehouse, "if you will turn to the third chapter of John and the sixteenth verse you will find my text." He preached seven sermons from that one text! The last night Moorehouse went into the pulpit, every eye was upon him, wondering what text he would preach from. He began: "Friends, I have been hunting all day for a new text, but I can not find one so good as the old one; so we will go back to the third chapter of John and the sixteenth verse." Moody said he could never forget the closing words of that night's sermon: "My friends, for a whole week I have been trying to tell you how much God loves you; but I can not do it with this poor, stammering tongue. If I could borrow Jacob's ladder, climb up to heaven and ask Gabriel, who stands in the presence of God, to tell me how much God loves sinners, all he could say would be, 'God so loved the world, that He gave His only-begotten Son, that whosoever believeth in Him should not perish, but have everlasting life.'" Moody was convinced, and changed his manner of preaching. Now he preached that God was behind the sinner with love instead of a sword, and that, in rejecting God, the sinner was running away from the God of love. Dear Lord we thank You for Your love. Help us look at the world with the Love of Christ. In Jesus’ name, Amen. Cherokee Legend and Our Father's Love. Would You Die For Somebody? A Different Look at Christ's Blood Shed for us. Are You Willing to Draw the Line?